The Xiaomi Redmi Note 2 was announced in August 2015, for a remarkable sub-US$200 price. It honors Xiaomi's philosophy of providing quality Android smartphones for a fair price, while delivering an excellent user experience. The Redmi Note 2 brings improvements over its predecessor, but can this smartphone hold its own against such competitors as the LG G4, Galaxy S6 Edge+ or the iPhone 6S Plus? Find out in our full Xiaomi Redmi Note 2 review. The Redmi Note 2 was released to the Chinese market in August 2015, for about US$140. The Prime version, which comes with 32 GB of onboard storage, costs about US$156. If you want to buy it, however, you'll need to do so online, because it's not officially available in the United States. The Redmi Note 2 design is not exceptional. This second-generation device is made from plastic and glass, with a removable back cover and a removable battery, unlike many other new phones on the market. This device is not light or thin, but it still feels nice in the hands. Although it has a 5.5-inch screen and fairly thick edges, the Redmi Note 2 can easily be used with one hand. The sleep/wake and volume buttons are both located on the right-hand side of the device, which means adjusting the volume can be done one-handed, unlike on the Samsung Galaxy S6 Edge+, where these buttons are on opposite sides, necessitating the use of two hands. On the front there's a 5 MP front camera and a notification LED. 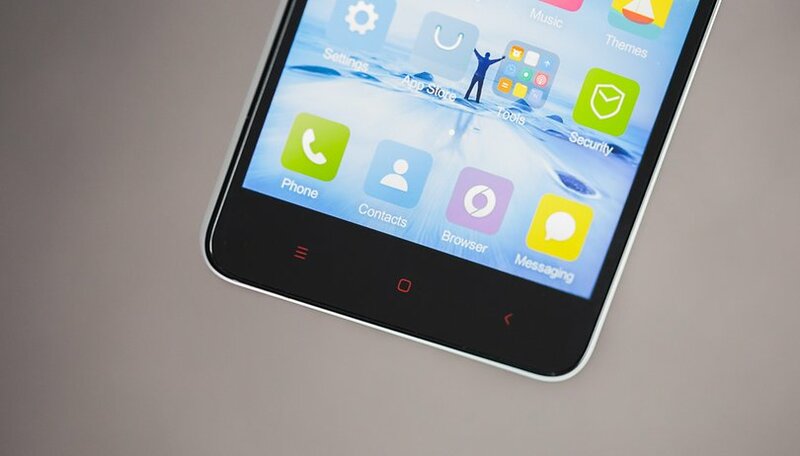 At the foot of the display are capacitive buttons, a classic feature of Xiaomi design. The Redmi Note 2 may not be the most creatively put-together smartphone, but it is the essence of simple and functional. The Redmi Note 2 display is one of the phone's highlights. The screen makes up about 72.2 percent of the phone's front surface area, coming in at 5.5 inches with Full HD resolution (1,920 x 1,080 pixels) and using IPS LCD technology. The screen's quality, at least on paper, is the same as that of the OnePlus 2. The image quality is satisfactory. It offers balanced brightness and contrast, but the overall vividness of the colors could be better. The Redmi Note 2 does produce better viewing angles than the comparable OnePlus 2 though. Watching YouTube and Netflix is ​​a treat on this 5.5-inch screen, enhanced by the decent audio quality. It's also a nice display to use for reading and web browsing, because the display brightness is not too heavy, meaning your eyes will thank you later in the day. This makes the overall user experience more natural and pleasant. The infrared sensor is a special feature, so to speak, of the Redmi Note 2.The IR sensor is not compatible with all TVs, but works with some third-party applications. Many smartphones, such as those from Sony, no longer offer this option in newly launched models, but Xiaomi decided to invest in the technology. The Redmi Note 2 software, sporting MIUI 7, is based on Android 5.0.2 Lollipop. The colorful MIUI interface is built from the source code of Android (AOSP), so the software has its own cycle of updates and features. To get Google apps, you will need to flash the GApps package. If you do choose to import this phone online, keep in mind that there will be some software limitations, such as language options. The device I had for this review was Chinese, and only offered English besides that. The Redmi Note 2 does not have the traditional separate app drawer at the bottom of the home screen. The application tray is on the homescreen, as you'll find in Apple's iOS. To delete an app, simply hold the icon and push it toward the trash can that appears at the top screen. The system has a 'do not disturb' mode that can be configured according to your needs, as well as an option to configure the behavior of notifications. MIUI has a shop with themes, lock screens, icons packages, sources, wallpapers and widgets. Other Xiaomi owner utilities are present in the Redmi Note 2, such as a data manager, antivirus, recorder, notepad, file manager and a weather app. In general, MIUI 7 is surprisingly good and customizable. If you're keen on customizing your smartphone, the Redmi Note 2 is a smorgasbord. The Redmi Note 2 packs a MediaTek Helio X10 octa-core processor up to 2.2 GHz. This CPU is equivalent to the Qualcomm's Snapdragon 810, minus the overheating issues. For graphics it has the PowerVR G6200 GPU. The device also has 2 GB of RAM and comes in two storage variants: 16 GB and 32 GB. Added to this is the MIUI 7 system. This smartphone runs graphically advanced games, copes well with the multi-tasking feature and, during my testing, suffered no problems, freezes or crashes. However, as my unit came from China, many of Google's applications were not installed and I had flash GApps, which took some work. At times, for example during charging or while under intense stress, the hardware of the Redmi Note 2 got a little warm, but no more than to be expected from modern smartphones. I'm not a fan of having the speaker on the back of a smartphones let alone a speaker with mono audio quality, which is what the Redmi Note 2 has. Its sound quality is pretty good, however, especially if you cup it with your hand while watching video. Even when I placed the device under a desk with the screen facing up, the audio was not stuffy, thanks to a small ledge that stops the speaker grill making contact with the table surface and blocking the sound. Both the speaker and the microphone of this Xiaomi device did an excellent job. The sound was clean and clear, even in noisy environments or on the street when the microphone was in contact with strong wind. Before I wrote this Redmi Note 2 review, I had read a number of tests by other sites, all of which listed its camera as a low point. I have to disagree, however. The camera of the second generation Redmi Note is above the standard of cameras on other devices that can currently be found on the international market for less than US$200. As shown below, the Redmi Note 2 camera software interface offers manual mode, light exposure and manual focus as well as a series of filters. The 13 MP rear sensor camera handles colors and focus well while providing a significant level of detail in poorly-lit environments. The front camera offers good image quality and video and the sensor will capture enough detail that selfies won't be a problem. The Redmi Note 2 battery has a capacity of 3,060 mAh, which is a surprise for a smartphone that costs less than US$200. And with QuickCharge 2.0, the battery can charge to 60 percent capacity in just 30 minutes, although it still needs nearly two hours to reach full capacity. Even with good capacity, fast loading and the possibility to remove it, the Redmi Note 2 battery falls short on battery life. It won't last more than six hours of intensive use, on average, and around four hours of screen-on time with Wi-Fi enabled. The Redmi Note 2 is undoubtedly the best smartphone you can find today within its price range. The 32 GB version of the Redmi Note 2 can be bought in China for a bargain, sub-US$200 price and has everything you might need from a smartphone, both on the hardware and software fronts. If you're considering a Chinese smartphone with AOSP software and want to use it for at least two years, it's a good investment. Granted, MIUI is not so simple to use, but anyone who enjoys customization will love this interface. Does it really stand up to competitors like the LG G4, Galaxy S6 Edge+ or iPhone 6S Plus? Looking at the finer details, I'd definitely say yes. It's no wonder that this smartphone had sold more than one million units since launch. Do you like the Redmi Note 2? Let us know in the comments. How is it working ? I want to have one .. Performance ?? How much will you give it on 10 ..
Xiaomi could well expand its list of smartphones here in Brazil bringing Redmi Note 2 in the next months. Rumors about a 5.1.1/6.0 upgrade?